Energy is a commodity — a raw material like any other raw material needed to manufacture your product. To make potato chips you need potatoes, oil, and energy. To freeze lobster you need lobster and energy. To produce bagged potatoes you need potatoes, wash water, bags, and energy. In the production process you waste as little as possible of the raw materials that you can see and weigh and touch. Likewise, it makes sense to waste as little as possible of that costly raw material you can’t see: energy. The first step in minimizing energy waste is to come to understand the where, when, why, and how-much of your plant’s energy use. The tool for acquiring this information is the energy audit. Just as a financial audit paints a detailed picture of how a firm spends its money, an energy audit paints a detailed picture of how a firm uses the energy it buys. The first kind of audit helps pinpoint money waste; the second kind helps pinpoint energy waste. · Copies of the past year’s electricity bills. · If a thermal audit: oil bills, propane bills, water bills — whatever is relevant. Audit data includes a 24-hour profile of the plant’s electrical demand and power factor. · All electrical loads are identified, and with the aid of nameplate data, measurements, and running time estimates from plant personnel, the demand and consumption of each load is estimated. · Our personnel solicits your thoughts about any opportunities you see that might save energy dollars. · Enter the electrical load data into a computer and create an electrical load inventory of your facility. 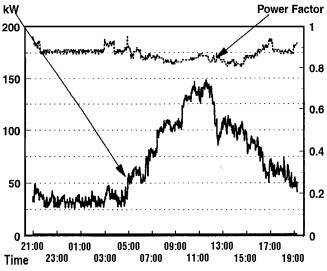 · We produce a graph of the 24-hour wattmeter and plant power-factor data such as the one shown here. · We then compare the wattmeter data with the load inventory. Does the measured data match what the load inventory indicates we should see? And do they both fit with the actual monthly electrical demand and consumption figures found on your electricity bill? · If there is a discrepancy, we dig deeper to find out why. We return to your facility and, together with your staff, go hunting for what we missed the first time around. Was there a major load we neglected to include? Is there perhaps a motor or process that is being left on rather than being turned off as we assumed? Once we have an accurate picture of what is going on, the measured whole-plant demand profile will balance with the load inventory and with the monthly electric bills. 4. We then prepare a written report that contains the load inventory and graphs, as well as recommendations for changes that would reduce your energy expenditures. Included are approximate figures for the cost of implementing the changes, the expected savings, and the simple payback. 5. We bring this report to your facility, sit down with the CEO or Plant Manager, and for half-an-hour or so discuss the report and the financial assistance we would be prepared to provide if you went ahead with the recommended retrofit. The second approach is to periodically repeat the audit process. We would be pleased to come back each year to do follow-up energy audits and provide you with updated reports. Also, should your own energy monitoring reveal any mysterious change in energy use, we would be glad to help you track down the cause. Is it time for an energy audit at your facility? Give us a call! Contact Mike Proud or Ron Estabrooks at 368-5010 (toll free).